Erick Rudolph has had himself one heck of a season and the hot streak for the driver from Ransomville, N.Y. continued on Wednesday night of NAPA Auto Parts Super DIRT Week 47 when Rudolph drove a brand new car to victory in the 100-lap DIRTcar 358 Modified Series ‘Kickoff Party’ at the Weedsport Speedway. 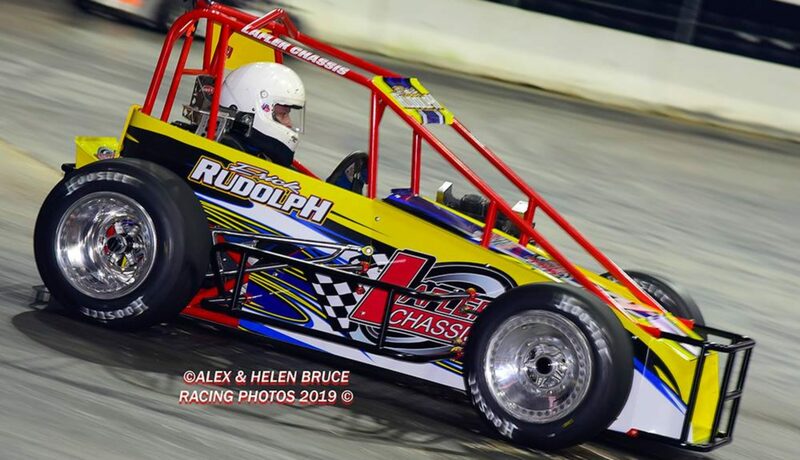 A winner as part of the Super DIRTcar Series visit to Weedsport this past July, Rudolph is already a guaranteed starter for Sunday’s Billy Whittaker Cars 200 and he showed exactly why that is yesterday evening. The 2018 Ransomville Speedway and Land of Legends Raceway track champion absolutely dominated, taking the lead from Pat Ward on lap 14 and never looking back. At the start of the main event, which was lead to the green flag by Ward and Todd Root, Ward took control early on until the LJL Racing, Gypsum Express No. 42p quickly found lapped traffic just after the completion of lap 10. Shortly thereafter, Rudolph used this opportunity to pounce on the early front runners from his third position, first taking second from Root, and then coming away with the race lead from Ward just a few circuits later. For the first 20 laps, the 100-lap main event went without a caution flag until Mike Maresca touched the backstretch wall in the No. 7mm, ending his day early on. With Ward and Root now lining up right behind the race leader, this gave the second place Super DIRTcar Series point man an opportunity to show just exactly how strong the Opti-Coat No. 25 car really was, and Rudolph did just that as he walked right away from the field on each and every restart throughout the duration of the main event. With heavy hitters such as Matt Sheppard and Brett Hearn dropping out of the race early due to mechanical woes, the added weight of a few potential challengers began to fall off Rudolph’s back due to attrition. For the first quarter of the race, it appeared as if Root would be able to keep pace with Rudolph, but that was until fourth starting Tim Sears Jr. began to pick away at spots on the podium, first passing Ward, and later getting by Root for 2nd when the No. 15 car caught a rut on lap lap 46. When Tyler Meeks hit the backstretch wall on lap 48, this now gave Sears a shot at Rudolph and it appeared as if the 83x may be the 25 car’s biggest challenger, but that just did not happen. At the drop of Dave Farney’s green flag with 57 laps complete, Rudolph hit the throttle right away and by turn one, was already nearly an entire corner beyond the remaining top five cars, which consisted of Sears, Root, Ward, and eventually Larry Wight who drove from tenth to throw his name into the mix. On that same restart, Ward powered under Sears to take second back with just over 40 laps to go, as Rudolph slowly began to catch traffic. Rudolph caught back up to slower cars again just prior to lap 70.With the cushion proving a bit tricky, he knew he had a narrow surface to work with and had to be careful while working through lapped traffic. Even when Rudolph was slowed every so slightly, it did not give Ward the opportunity to close, nor did the the yellow flag that came out on lap 75 for Jessey Mueller’s No. 19m. His ride had a tire go flat as a result of contact with the inside retaining wall, plaguing an otherwise impressive fifth place effort for Albany-Saratoga Speedway regular. When Mueller broke out of the top five, this allowed Ron Davis III to continue his charge from twelfth up into the fifth spot, passing Root, Bobby Varin, Lance Willix, and more to get there. After a brief caution period, runner up position again changed hands on the ensuing restart, but this time it was Sears taking second back from Ward, with Ward falling back to third and eventually feeling the heat from Davis in fourth. Another yellow with six laps remaining for a tangle between Ryan Susice and Billy Whittaker in turn 4 halted Rudolph’s runaway victory one more time, but tonight Erick Rudolph and team had them covered, keeping all challengers at bay for his second checkered flag of the season at The Port. Davis and Wight completed the top five, while Chad Brachmann, Bobby Varin, Robbie Bellinger, Roy Bresnahan, and Steve Bernier made up the remainder of the top ten. 358-Modified St. Lawrence Radiology 100 (100 laps): Erick Rudolph, Tim Sears Jr., Pat Ward, Ronnie Davis Jr., Larry Wight, Chad Brachmann, Bobby Varin, Robbie Bellinger, Roy Bresnahan, Steve Bernier, Lance Willix II, Steve Bernard, Ryan Arbuthnot, Marc Johnson, Dan Creeden, Glenn Forward, Mario Clair, James Sweeting, Ryan Susice, Billy Whittaker, Jessey Mueller, Rocky Warner, Todd Root, Tyler Trump, Brett Hearn, Tyler Meeks, Carey Terrance, Louie Jackson Jr., Matt Sheppard, Mike Maresca, and Danny O’Brien.